Septic systems are common in rural areas and less so in cities and towns like Plymouth. Many people who move to the country from a larger community know little about septic systems and what to expect. 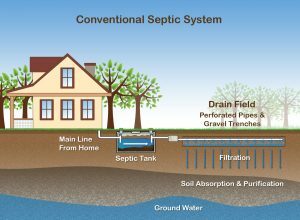 If you’re thinking about moving into a home with a septic tank, it’s important to understand how a septic system works and what kind of maintenance is involved. City sewer, which is most common on neighborhood environments is an underground pipe that connects your home to your community’s water treatment facility. Homeowners who use sewers are only responsible for maintaining the sewer line that runs beneath their own property, and most sewers need little to no regular maintenance. In older homes it’s common to find old tile or clay lines that over time may shift and allow roots to grow which would be the homeowners responsibility. A septic tank is an underground tank connected to a drain field. All waste water produced by the home is collected in the tank, where it separates into multiple layers. Bacteria inside the tank break down the waste, and when the water reaches a certain level, it runs into the drain field where it is filtered and cleaned through the soil. Homeowners who own septic tanks are typically responsible for all maintenance of the septic tank, including repair, replacement and pumping of the tank. Private septic systems are most commonly found in rural areas and acreage homes. There are a few types of private septic systems, however, the two most common are drain fields and mound systems. Some neighborhoods also have common community septic sites. In reality its just a larger centralized septic for the neighborhood and you will fins some sort of maintenance agreement with this type. Septic tanks must be pumped and the contents must be removed on a regular basis. Typically, septic tanks need to be pumped every 2 to 3 years. The pumping schedule for a septic tank will depend on the size of the tank, number of people in the household and the amount of water that the house uses on a regular basis. Tanks that are too small for the amount of waste water produced will need to be pumped more frequently than septic tanks that are properly sized for the property. Homeowners cannot pump their own septic tank; they must contact a septic tank pumping company to pump their tank for them in most cases. Cost on this ranges from $250-$500. Septic tanks are designed to hold water, waste and toilet paper, and nothing else. The inside of a septic tank is a very delicate system. Flushing the wrong substances down into the tank can cause problems. Medications, anti-bacterial soaps and other cleaning products can kill beneficial bacteria in the tank. Meanwhile, food particles that get flushed into the tank can clog the drain field. Homeowners with septic tanks are often advised not to use garbage disposals because this can result in a faster buildup of waste and a potential clog. Foul odor on the lawn. Swampy areas in the grass. Areas of unusually lush green grass. Drains that are consistently slow throughout the house. All of these signs are an indication that a home has a full septic tank that needs service, and could be a sign of a larger problem as well. You will not be able to tell how often a septic tank needs to be pumped based on the pumping schedule of the previous occupants of a home. However, if you’re thinking about buying a home with a septic tank, it’s important to find out when the tank was last pumped and how large the tank is. This information can help you set a pumping schedule for your tank upon move in. Talk to your real estate agent to find out more information about the history of a septic tank for any home you’re thinking about purchasing. DMG is well versed in selling homes with septic systems and can easily help guide you through the proper channels for inspections, maintenance and rules.